Our experience in the custom marine fabrics is what makes us so well-known in the boating industry. Marine fabrication is a specialty trade which requires a keen eye for detail. Each job is handled by an experienced professional from the very beginning. Sunbrella® Outdoor acrylic is the preferred fabric in the boating industry. Our bimini tops and enclosures will provide the solar shading you need to stay cool on those hot summer days. With many options available, we can fabricate free-standing bimini’s, California dodgers, connectors, full enclosures with screen’s and windows, bridge connectors, wheel covers, and much more. Our bimini frames are constructed out of stainless-steel tubing to provide you with a clean rust-proof look, as well as strength against high winds when on the water. All of our hardware is specifically made for the marine industry. We also manufacture travel covers, winter covers, cockpit and bow covers, storage boots, seat and console covers, and much more. We custom manufacture travel covers, also known as Mooring Covers. A Mooring Cover consists of an outdoor material that covers the entire boat from bow to stern. The fabric generally ends 4 inches below the boat bumper. There are bunjii and snap attachments as well as a draw chord around the perimeter which holds the cover down while traveling or in storage. Our mooring covers have vinyl reinforcements sewn on the underside of the cover where there may be high rub areas such as the windshield, trolling motor, sharp corners, tie off cleats, etc. 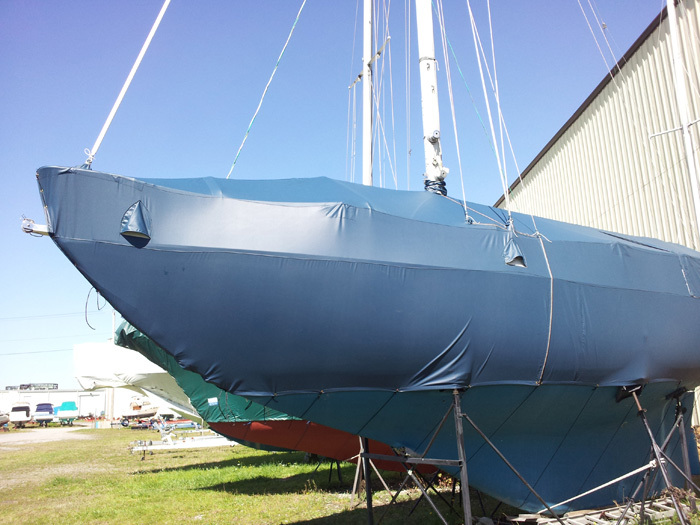 Our mooring covers are usually made with a resin-coated polyester fabric known as Aqualon. 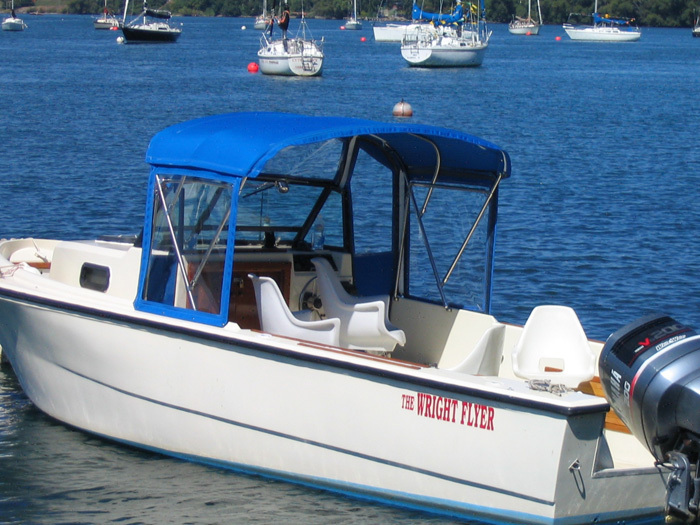 A Cockpit cover is usually purchased when you store your boat in the water at a dock. This type of cover makes it easy to install with snaps around the windshield and back to the stern of the boat. You can have the option of covering the windshield to protect your boats interior dash. This type of cover is made using Sunbrella fabric. The center of the cover is supported by an adjustable pole, allowing the rain water to shed off. There are many custom options with the two types of covers listed above. Outboard motor covers, trolling motor covers, cut-outs for the well or tie-off cleats, fiberglass bows or adjustable poles are just a few of the options available. Help protect your investment by purchasing a custom winter cover. Our two-piece Resin-Coated Polyester fabric is patterned to fit your boat like a glove. Our method of sewn vinyl reinforcements at each stanchion, bow rail, ridge pole, and stern rails will make the cover strong and last long. A tight fit ensures the snow and ice will shed off the fabric minimizing stretching due to heavy loads. Our winter cover frames are built with 1-3/8 inch Galvanized Steel pipe. The “A” frame system includes a leg at each stanchion, and a center ridge pole running just above the boom attaches to the bow pulpit. All part’s of our frame touching your boat’s deck include rubber boots to eliminate scratching or wearing. Whether you store your boat with the mast up or down, we can make it. With the mast up, we include zippered cut-outs at the mast and each line going up. Each line also includes a collar tie which minimizes water entrance. 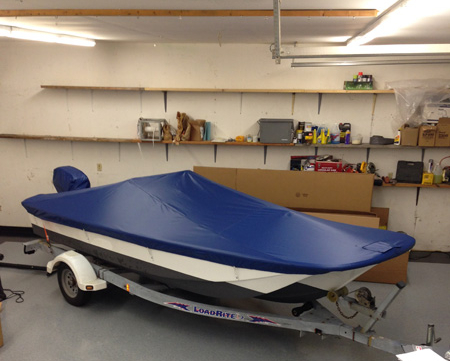 All Covers include a zippered entrance allowing you easy access to your boat during the storage months. Our choice for #10 YKK zippers and Gore-Tex® sewing thread ensure a strong and long-lasting product.